Do These Pass as Greys? My goal in dying this fabric was to achieve a 5 step gradation of greys with black. 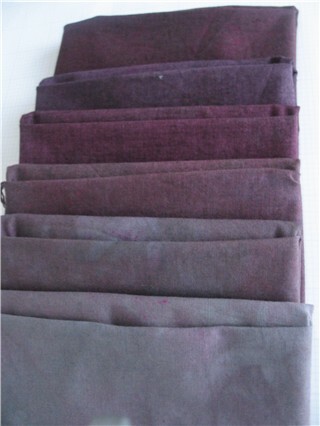 Well, I got some really beautiful fabrics, not 5 steps of greys and a black, but beautiful none the less. I am anxious to use the fabric in a project I have going right now, but I think I’ll be heading back to the dye studio (the kitchen sink!) for my greys. There are a few problems with these. First off, they are very warm; almost burgandy. I know there was a lot of blue in the dye, because I saw it going down the drain as I rinsed. I read in the Dharma catalog that chlorine in the water can inhibit blues. Maybe my water has a lot of chlorine in it? I think I will try some distilled water instead of tap water to see if I can get a slightly cooler grey. Thirdly, there are some spots in the fabric where the dyes didn’t get completely dissolved/mixed and it left a dot of color. I guess I’m going to have to stop being lazy and get the old blender out to mix the dyes to be sure they are mixed. Can I suggest that you might want to cut the dye even more? If, for example you want your current lightest fabric to become your “middle” next time, then you’d only need to start with 2 tsp. Hah!!! Yours at least are a much nicer color than mine…I ended up with muddy olivish green instead of grays. We corrected for the clorine but I think my dye solution started out way too heavy on the black dye…if I were going to do it again I would start at the end of my cuts which would be about 1 tsp of black. I could not tell which pieces were from which container either until I got to the two lightest ones…fun stuff though, dyeing fabric…going back for another class in 2 weeks that will be a rainbow progression. That should be a nicer result – at least I sure hope so! The problem with blacks is that each black dye has a slight color tint. some dye blue, some red and some green. 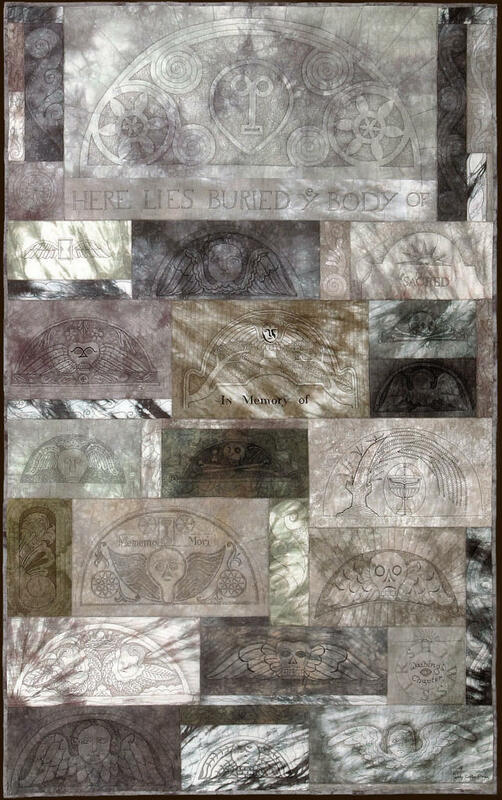 I found this out when i dyed grays for my quilt Graven Images based on grave stone imagery. If you look in the dharma catalog they tell you which black is a truer black and which color each black tends to lean towards. i found that often I could balance out the color by adding the compliment and get a more nuetral grey. For example your grays are leaning towards red purple, i would add a little lemon yellow, (cool yellow, toward green not orange) or your friend above is green, so she should add a TINY amount of magenta. The dye color khaki added to some blacks makes a beautiful warm grey. To get the light greys you might want to start out with water in your cup and add a small amount of dye to it and work darker by adding more dye. Dyeing fabric is sooo fun. good luck! blogger cut off my url for graven images. you can look on my blog on the link “see my art quilts” to see a picture of this quilt. lots of greys.I will try again and see if it comes up whole or gets cut off. Yes, they are beautiful! Even if they weren’t what you were going for initially, they are just lovely. They are beautiful colors. I found a Sabricon dye that had a really nice black. I got it from Pro Chem.